REFLECTIONS ON KING EDWARD COVE - By Tim and Pauline Carr. It was one of those rare and perfect afternoons in South Georgia. As our little boat Curlew sailed towards Grytviken, the mountains came into view one by one. Which was Mount Paget, the highest, we wondered? They all looked so stunning, glittering, white and very tall against the blue sky. At sea level the snow was melting back from the shore revealing the emerald tussac with elephant seals and penguins dotted on the beaches. Curlew, worked her way into the Cove in the lightest of breezes, and we dropped her anchor off the rusty whaling station in front of the museum building. It didn't take long for Nigel Bonner, Bob Klusniak and Ian Hart to come out to the forecourt and wave a welcome. There was a great feeling of relief and satisfaction having made the week long passage from the Falkland Islands, dodging a plethora of icebergs and gales for the latter part. But now here we were, expecting to spend a year based in Grytviken. You could not put a price on the excitement and privilege of spending a whole year in this most awesome of all the places we had visited during a 25 circumnavigation with our engineless centenarian yacht. It amazed us to think that when Curlew was first built none of the whaling stations or signs of man would have been here - excepting a few inconspicuous sealers relics. Museum project Director Nigel and his two man team had arrived a week or so ahead of us, aboard a Royal Fleet Auxiliary ship and were getting on with developing new exhibits so Tim and I were soon in the thick of it too, making and painting signs for a heritage trail, building and painting new exhibits - the museum had only opened in the most basic form at the end of the previous season but, as Nigel had proudly commented, the two prototype exhibition rooms had been well received by passengers from the couple of cruise ships that had visited. We were well suited to the job with Tim bringing his shipwright skills, honed on classic yacht restorations, and myself having been an office manager as well as professional yacht painter and finisher. Both of us had worked at the Falkland Islands Museum and we were particularly proud of our restoration of Stanley's foremost mounment, the whalebone arch. This had been our first tenuous connection with South Georgia because two of the four 21 foot long blue whale jawbones had originated from here. Nigel was sympathetic to our urge to explore and soon let us go off for a wonderful week's cruise. There was a long list of work to be achieved during the winter too, weather permitting. This short cruise was the first of many when Curlew would return with her bilges bulging with artefacts for the museum, and decks covered with bulky timber and tools, sourced in the other whaling stations. Among the 18th and 19th century treasures was a delicate copper riveted bucket and bottles which we found uncovered by the side of a stream. All these items needed care and protection as prior to the founding of the museum so many things were being 'souvenired'. A couple of months later we waved goodbye to Nigel as he flew over the museum in a helicopter taking him on the first part of his homeward journey. We had been very fortunate to spend these weeks with him, absorbing his amazing eclectic knowledge and having many a laugh from his entertaining anecdotes and robust humour. Although we were to correspond for the next year and a half, we sadly were not to see him again due to his untimely death. In the meantime our "one year" had begun to extend and we were firmly hooked by the island. Depsite the hardships and risks of sailing an engineless boat around the shores, the rewards were huge and we were also learning to ski and travel safely in the mountains. From the museum's early germination we began to plan how it could develop and improve and we were ambitious to put these concepts into reality. In 1992 until 1999 there had been only a geriatric generator, a lukewarm greenhouse oil heater, and no running water or toilet. So we lived aboard Curlew up until May 2000 by which time the museum and its infrastructure was almost unrecognisable from the semi-derelict building surrounded by a jungle of heaped up scrap metal and junk. For the first few years there was an incredibly tight budget so any growth was difficult. It was impractical to charge an entry fee but slowly the shop began to develop, as did the number of visitors - all, it seemed, very anxious to part with their money in aid of a good cause and to carry off souvenirs of such a distant destination. Some even donated generously. This money went into essential building maintenance and improvements where possible, which we had to carry out ourselves or with the help of summer staff. The shop was a double edged sword in that it earned the desperately needed funds but took our time away from the "real work" of the museum itself. Then the church suffered severe damage from hurricane force winds and was condemned as unsalvageable. David Tatham, the Commissioner of South Georgia, asked Tim if he could devise a plan to restore the church and this he duly did including a comprehensive list of all the materials and time frame and tradesman requirements. Bob Burton, who had been appointed as Nigel's successor as Director, brought all his organisational skills into purchasing some of the these materials from England. Tim salvaged timber from the whaling stations with the help of HMS Endurance. He rebuilt the steeple supports, the steeple planking, covering it with felt and battens. All this was done, dangling from the apex of the steeple, from a bosun's chair, as if he was working on a yachts mast. Then he sistered up rafters and designed and made patterns for fabricated metal gussets which he installed along with much strengthening and repair as well as removal of rotten wood. The following year Bob organised more materials and a team of five men including one qualified builder, Golly Gallsworthy soon augmented by another builder Dave Peck from the Falkland Islands. Tim milled all the timber in the now vastly improved workshop powered by a new generator. Finally the job was done although Tim continued rebuilding the porch and the windows, handing over the latter to Harald and Hedel Voss to complete so that he could get back to working in the museum itself. Kenn Back patiently painted the church inside and out - a mammoth task for one man. With the rapid growth of tourism Tim developed a 5 year plan. It was a real struggle to convince "the powers that be" that the museum needed to broaden its scope. Most times it felt like we were pushing a wheelbarrow uphill - with square wheels! The visit of Sir Ernest Shackleton's granddaughter had given us more ammunition as she was clearly dismayed that there was nothing to commemorate her grandfather except his grave and memorial cross. Initially the eco-tourist had entered the museum to be greeted by nothing but gory photos and macabre whaling and sealing implements. Some even turned around at that point. We felt that although whaling was an important part of South Georgia's history, six decades in fact, there was also so much more to the island, so many up-beat and inspiring aspects. We were anxious to show this, so with only tenuous approval we made the main entrance hall, now named the Bonner Room, into a general information area with maps and wildlife photos with a taxidermy specimen wandering albatross flying above. At the same time the Fullerton Room became "Discovery and Exploration". We consolidated the sealing and whaling into three rooms, later adding a fourth one about the whaler's trades. Our favourite room was the natural history Prince Room and here we were able to show our favourite aspects of the island. Tim built a wall to ceiling display case with salvaged hardwoods from Stromness and we filled it with a wonderful assortment of specimens we had been acquiring for this purpose, a natural history treasure trove. When we were able to get, through private donations, the hugely talented taxidermist Steve Massam down from the Falklands, it really began to look great. The Museum Trust agreed to drop the 'Whaling' part of the title so that it became 'The South Georgia Museum'. The museum's house flag and logos - originally a dead whale and a sealers' trypot - now became a wandering albatross superimposed on the sailing boat James Caird. This reflects two of the most memorable items in the museum's collection and the more positive theme. The History of Administration, (The Jarvis Room) eventually followed and this included documenting the invasion and liberation and subsequent British military presence. As always we concentrated on three dimensional artefacts whenever possible. They say a picture is worth a thousand words, but we believed that an object was certainly worth a hundred photos! Over the years Tim had built a couple of dozen display cases, from timber he had salvaged, and each one filled with evocative object bringing history to life. Visitors who came anually were very complimentary about the changes which encouraged and reinforced our commitment and dedication. In 2000 parts of the cemetery fence were demolished yet again by over-zealous elephant seals, and it was obvious that it was rotten and needed completely replacing. Tim had to take his attentions away from the museum once more, but this was clearly another essential project. He replaced the whole fence, posts and rails, with salvaged timber from the Grytviken butchery upper floor as well as replacing several of the crosses with replicas. Since the Argentine invasion of 1982, and subsequent liberation by British troops, the South Georgia Government's perception of the island was slowly changing to one of a national treasure. 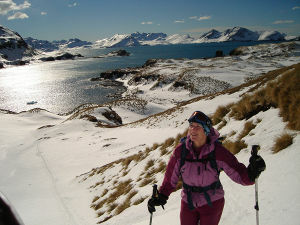 This was highlighted with the departure of the last soldiers and arrival of the British Antarctic Survey (BAS) in 2001. The previous year also saw a construction company, Morrison PLC, arrive to build the new BAS base and demolish some of the older, unsafe houses at the Point. Restoration work started on Discovery House, a GSGSSI initiative, and it seemed only logical to us that the Government, now much more affluent due to lucrative fishing licenses, would also take on the maintenance of its own buildings that held the museum's collection. Tim was able to persuade them to do this which freed the museum team to concentrate on the museum development rather than be stuck on the treadmill of high maintenance of 85 to 90 year old buildings. We expanded the shop and moved office, archives and taxidermy and fine workshops upstairs. With trenches being dug for the BAS water supply we were able to persuade the GSGSSI to undertake a long standing dream, to have power from the BAS generators fed directly underground to the museum - 24 hours a day. Better lighting in the museum and emergency systems flowed from this and the following year a fibre optic cable connected us with the BAS computers - eventually to broadband internet. Concurrent with the clean-up of the whaling station and removal of all the hazards that had so worried us for a decade, GSGSSI commissioned a huge rebuild of the museum and curators' cottage. There were to be all new roofs and windows and central heating in both buildings and new floors throughout the museum at ground level. Many of the old buildings were knocked down, as dangerous, and we had to re-arrange all aretefact and equipment storage to better systems for the future. The last really major step was when the then Commissioner, Howard Pearce, agreed to our long standing request for a percentage of passenger landing fees to go to the museum. Finally, 14 years along the line, the museum was on a solid financial footing. The shop was turning over £130,000 annually, we had enough staff to effectively service the 108 vessels - including 50 cruise ships, military, BAS, yachts etc. We estimated 8000 visitors came into the museum each year and the "Made in South Georgia" souvenirs were taking off in a big way, to tune of over £10,000 profit - more than justifying the increase in summer assistants to three. Since Nigel Bonner established the museum there have been enormous changes. There were just six small cruise ships in the 1992-3 season, sixty four in 2007-8, and many of these vessels are much larger. Whether this is a good thing for the island remains to be seen. The beautiful old church is now solid and will stand for the foreseeable future and the whalers' cemetery has a big, solid fence and is well maintained. The museum is restored, full of fascination and encompassing all South Georgia's history. It now even includes a new Maritime building as the exhibits grow. Over the years there has been huge support for the museum from various members of the Government, military, British Antarctic Survey, cruise ship operators, staff and passengers. The museum has been fortunate to have keen and motivated assistants helping every season. On a broader scale, when we arrived in 1992 it seemed that very little was being done to protect South Georgia's wildlife, no conservation policies to speak of despite its tragic history of waves of exploitation. Seals, whales, and fish species successively had been brought to critical levels. The cultural history was just beginning to get a little attention with the removal of much of the crude oil and some of the loose asbestos from all the whaling stations. This is what had led to the establishment of the museum at Grytviken. But the 1990s were to herald huge changes and in 1993 came a very significant step with the GSGSSI declaring a 200 mile economic zone to manage the fisheries which, although not very effective at first, has now become a model for fisheries worldwide. However, back then, we found ourselves battling almost constantly against the lack of environmental awareness. 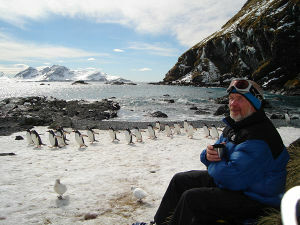 The main reason for us deciding to write our book Antarctic Oasis in 1997 had been to try to create a much greater awareness of this precious place. We hoped this would lead to more care and protection of one of the richest breeding habitats in the world with the greatest concentration of Antarctic and sub-Antarctic wildlife on the planet. At last the Government introduced an Environmental Management Plan in 2000. The often destructive presence of the military was replaced by the sensitive and environmentally aware British Antarctic Survey in 2001. Science on fishery sustainability is cutting edge and fishery management is protecting the resource. Furnace oil, asbestos and other hazards were removed from a very dangerous whaling station, making it once more a safe and fascinating place for visitors and wildlife alike. The differences between 1992 and 2006 were absolutely incredible. Almost to the day, fourteen years on from that first arrival into the Cove, we sailed away on board the Explorer II. 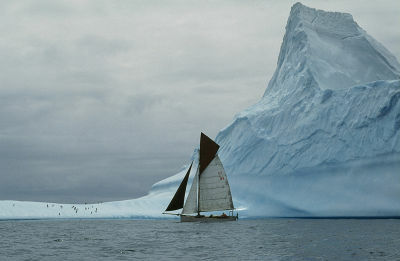 (Curlew had left in 2003 aboard the James Clark Ross to become a sailing exhibit at the National Maritime Museum, Cornwall.) As we watched the lights of King Edward Point, and farewell flares from the team at the base, fading into the distance, we had mixed feelings of sadness as well as excitement as we headed for a new life in New Zealand. We now have high hopes that the new UK based South Georgia Heritage Trust will be a positive change. It is good to know that it will be continuing to work proactively for the development and betterment of the museum, as well as the broader aspects of the island that we feel are even more important. Perhaps, with care, South Georgia can still remain an oasis for millions of seabirds and seals and increasing numbers of whales. And all those privileged to visit or care for it will continue to cherish its purity in a changing and troubled planet so that the mere knowledge of its existence soothes the soul. This page was last modified 13:06, 1 May 2009. This page has been accessed 38,236 times.